There is no such thing as a smart home: there's a lot of devices that you can interconnect that makes your home more interactive. But Google, Apple and Amazon are playing it from different directions. Apple is coming at it leveraging their entertainment and home angle -- but with low feature integration, the worst voice assistant and thus lower device count support. Amazon is attacking it like a commerce company with a shopping focus -- while acquiring their own device makers (Ring). Microsoft's Cortana and solutions aren't even worth tracking by many. They haven't figured out this space any better than their mobile phone story -- so while they have a competent agent, and some integration technology, only a few people seem to care as the phone and device angle is being won by the other companies. 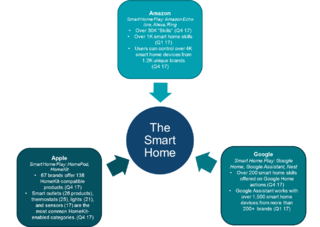 TL:DR; Google/Amazon have a home security story. Apple is falling behind. Microsoft who? This page was last edited on 5 February 2019, at 04:09.